For details about the upcoming 2018 ASPF Golf Tournament click the link. Below is a review of the highlights of the 2017 ASPF Golf Tournament. The first-ever Arkansas State Police Foundation Golf Tournament was held on Thursday, August 17, 2017 at the Paragould Country Club. Over $55,000 was raised through the generous contributions and participation of many individuals and organizations in Northeast Arkansas and beyond. The proceeds raised from the tournament will benefit the Arkansas State Police Foundation . A sincere THANK YOU to all of the sponsors, contributors and golfers who came out to provide support to this great organization. First National Bank was glad to have been the presenting sponsor of this event. 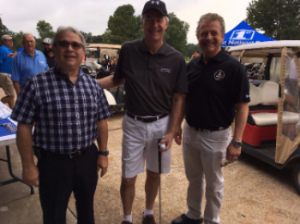 We are thankful that Arkansas Governor Asa Hutchinson was able to attend and participate as a golfer. Paragould Mayor Mike Gaskill also attended and spoke briefly to welcome the participants to Paragould. Jonesboro Mayor Harold Perrin also participated during the afternoon flight as a golfer and was eager to show his support for the ASP Foundation. Other law enforcement officials in attendance included: Arkansas Attorney General Leslie Rutledge and Second Judicial District Prosecuting Attorney Scott Ellington. Forty-seven teams took part in the event which was an 18-hole scramble divided into morning and afternoon flights. In the afternoon flight, Holiday Liquor/Bulldog Liquor won over C&S Cleaning in a playoff. Both teams shot 50 in regulation. Burris Inc. was third at 53. Unico Bank/Community Bank took first place in A.M. flight with a 52, followed by Centennial Bank (54) and Robinson Farms (54). The tournament also had various hole contests. In the morning flight, Paul Rowton won the longest putt on No. 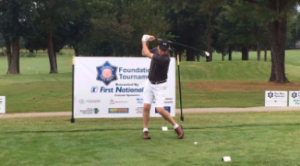 18, Hugh Dickinson won straightest drive, Jeremy Watson had the closest-to-the-pin and CPS won the longest putt on No. 4. In the afternoon, Sam Dickey won longest putt on No. 4, Jim Sullivan had the closest-to-the-pin on 12, Bud Schoeppel won longest putt on 18 and T. Wigginton had the straightest drive on the 9th hole. 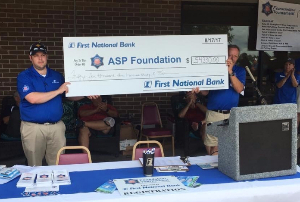 In the photo below, Will Brewer, Vice-Chairman of First National Bank and ASPF Board Member presents a check to Frank Guinn, Board Chairman of the Arkansas State Police Foundation. For more information contact Neely Camp at 215-4000 or email: neely.camp@fnbank.net .